The Natural History Museum have just announced the 2016 winners of their Wildlife Photographer of the Year competition. We were lucky enough to catch up with the 2016 winner in the Youth category, Gideon Knight to find out a bit more about his winning shot, entitled The Moon and the Crow, and the process of entering and ultimately winning the grand title of Young Wildlife Photographer of the Year 2016. "Late one cold January afternoon, as the sun was creeping towards the horizon, I headed down the road to my local park. This was already to be my sixth visit of the year to photograph here in the dying light of winter's early sunsets. I arrived at the park to see that the lake was still largely covered with patches of ice from the previous night that had - unsurprisingly - survived the day's cold sunlight. There were plenty of birds on the ice, and so I stayed by the lake for about thirty minutes, but the sunset never really developed, and the light quickly dropped away. With dusk beginning to set in its blue hues, and the icy cold gnawing at my fingers, I began the short walk home. To the east, I noticed that the moon was low in the darkening sky, creating a lovely contrast, and thought to myself, 'Ah, how nice it would be if a bird were sitting at the top of that tree', alas no birds seemed willing to save the moment, and so I continued on my walk. It was just a short distance further on that I spotted a Carrion Crow perched high up among the spindly branches of a tall sycamore. 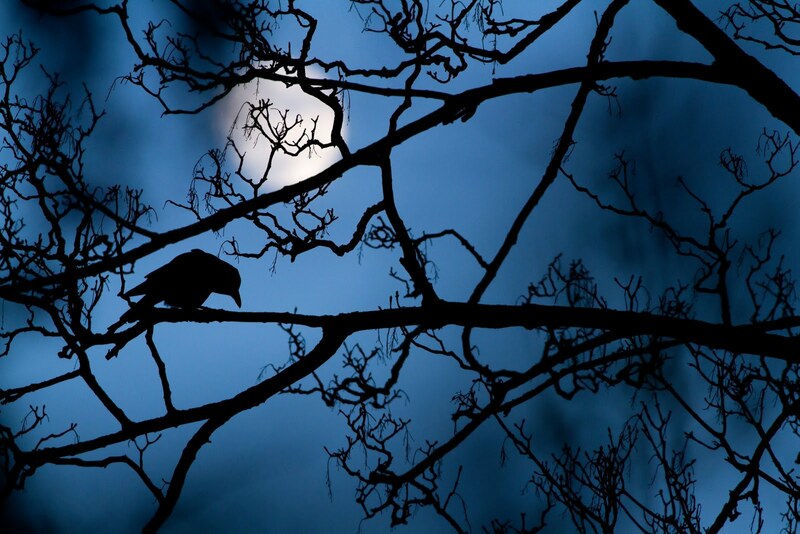 Worried that it might fly off, I got my camera ready, and carefully moved around until I could position the moon in the image behind the crow, silhouetting it and highlighting the twigs of the tree, creating quite a picturesque scene. By now dusk had well and truly set in, and so I had to adjust my settings to allow more light into the camera. I was shooting handheld on the Canon EOS 7D, a great camera but one which can struggle with high ISO's. As such, I went for a sensitivity of 500 to avoid getting too much noise. With my Canon 400mm set wide open at f/5.6, this left me with a shutter-speed of only 1/250th of a second at an equivalent focal length of 640mm. As a result of this (and let's not discount shivering), only every other shot was coming out sharp, and on top of that the crow was often turning its head down or away, making for a very obscure silhouette. I was determined to capture this beautiful moment, and eventually, the crow adopted the position I was after and my arms held steady enough for a clear shot. Happy with the image, I went home to enjoy a warming cup of hot-chocolate, never expecting that on a much hotter day four months later I would receive an email telling me that this picture had won a category in the prestigious Wildlife Photographer of the Year competition. And, when that did happen, well it took a little while to properly sink in; to have the honour of being a part of this competition was something I'd dreamed about for years. A further five months went by in nervous anticipation, until the week of the awards ceremony and the competitions unveiling was finally here. An absolutely incredible few days! On the Monday we spent an enjoyable evening at a soiree in the museum's Earth Hall, meeting and talking to many of the fantastic photographers who were in this year's competition. Then came Tuesday, the big night! Dressed in black tie, I was accompanied to the ceremony by my father and brother. The reception, a further opportunity to speak to some of the world's best photographers, started at 19:00, before the main event at 20:00. The ceremony itself took place in Hintze Hall, the museum's main entrance. It was, it's quite safe to say, awe-inspiring; the hall was filled with wonderfully decorated tables, there were lights, there were candles, there were flowers... and of course, there was a diplodocus! In the presence of delicious canapes, the awards then began, introduced by the museum's director Sir Michael Dixon and then hosted by wildlife presenter Liz Bonnin. There are three young, and sixteen adult categories, and throughout all of these were some absolutely inspiring and breath-taking images, it was also great to hear a bit of the stories behind a few of the winning photos and the passion photographers have for their craft and for the competition. After the category winners were announced dinner was served which was hugely enjoyable, with superb food and great company. Once pudding had been consumed, it was time to announce the overall winners of the competition, beginning with the youngsters. There was of course, one of those pauses of the kind that bring tension to the moment, and then they said... wait a second, my name? It was a surreal moment, I could hardly dare to believe it! My heart was beating at quite an unsafe rate at that point. To be a part of the competition was a dream come true, to win was, well there are very few words that come to mind. To say it was an incredible honour hardly does it justice. It was then, after I had been on stage to collect my award, time for the adult overall winner, a title which went to Tim Laman for his fantastic image of an Orangutan, a shot he'd first thought of twenty years ago! The exhibition was then opened, and the remainder of the evening was spent looking around, admiring the images in more detail. Throughout all the events the atmosphere was incredible and the organisational skills of everyone involved with the competition were brilliant. It was all such an incredible experience, something I'm sure I'll never forget." The Natural History Museum's Wildlife Photographer of the Year 2016 exhibition opens today, 21st October 2016 and runs until 10 September 2017. I do so agree with 'anonymous'. Your patience and dedication along with your attention to detail paid off in spades. Your account too was interesting to read, your observational skills generally would account for your photographic ability. Well done indeed.